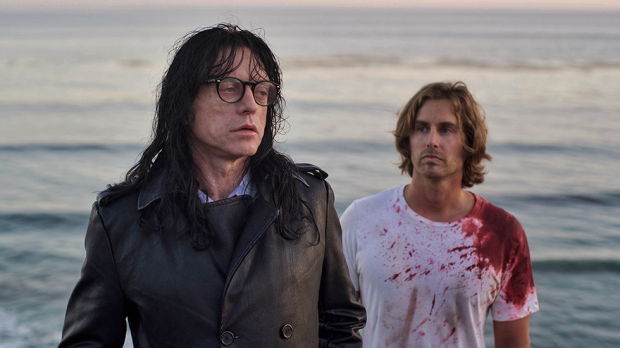 Fifteen years after the release of The Room, which is widely known as the worst (and greatest) film ever made, the main actors have teamed up again, this time with Greg Sestero as the creative force (as screenwriter) and Tommy Wiseau as the secondary character. Best F(r)iends is something of a combination of The Room and The Disaster Artist, though comes out as a mutated result. Unsure of whether it should be good or so-bad-it’s-good, it just ends up being bad. The story sounds wacky enough on paper to work. A homeless drifter, Jon (Sestero), crosses paths with a mortician, Harvey (Wiseau), where a budding friendship grows as Harvey offers the aimless Jon a job at the morgue so he can get his life back on track. But Jon soon discovers a potential side-business that could come about with the resources of the dead bodies – what this side business is and where it takes the duo is just too bizarre to spoil. This quirky story, as well as some of the finely cut and oftentimes unusually impressionistic editing, is just about the only praise that can be given to this well-intended, but tonally confused piece of oddball cinema. At least Sestero shows far more chops with this kind of acting, giving himself the chance to shine as opposed to his awkward and unsure performance in The Room, and Wiseau works wonders with his few funny lines. It seems like it’s aiming for a Twin Peaks feeling, of mixing the camp and kitsch with the horrific and nightmarish. But unlike that landmark TV show, this doesn’t lets its audience know when to laugh or to feel dread or to be weirded out, and instead leaves the audience in a state of confusion as it fumbles about juggling its different moods and fails to keep them in the air. The technical ineptitude from first-time director Justin MacGregor doesn’t help, with a constant stream of high school film student qualities that sorely stick out. But the bigger crime is the boredom that sets in once you’ve become accustomed to the craziness. A girlfriend for Jon is thrown into the mix in the laziest manner, just so she can keep the story’s gears moving, but the inanity of the film’s aimlessness as it contrives it way towards its “cliffhanger” denouement is really quite tiresome to get to. With very little of the weirdness of The Room and very little of the humour and sensitivity of The Disaster Artist, Best F(r)iends is instead as cold and lifeless as the cadavers that feature in it. All bone and no meat, it drags itself from one plot point to another, getting wearily less interesting with each one – if this was supposed to share the same oddball DNA as The Room, then it goes to show they couldn’t again capture that lighting in a jar.